Young John Barstow must have found it difficult to concentrate on sums with the American Revolution under way. His math exercise book, held at the Gilder Lehrman Institute of American History in New York, contains math problems, conversion tables, and other study aids. Sandwiched between these pages is a blank leaf filled with Barstow’s transcription of what must have been a popular patriotic song. (We know Barstow didn’t make it up because a slightly different transcription of the same song, dated 1775, also exists.) The leaf is dated Jan. 2, 1777. The song is bloody and brash, and you can imagine how its high drama would have appealed to young tastes. 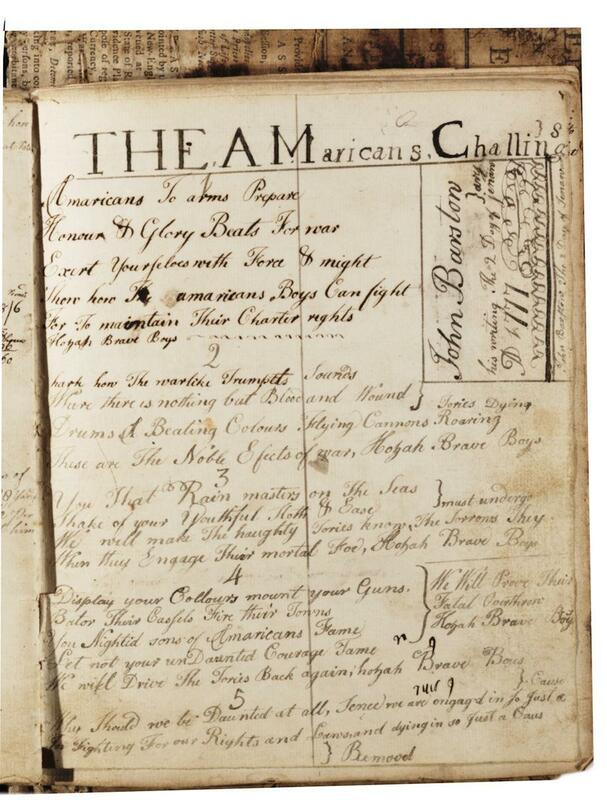 Titled “The Amaricans Challings” (“The Americans’ Challenges”), it calls Americans to arms, reassures them of the nobility of their cause, and threatens “Fatal Overthrow” to the British. The myriad spelling mistakes aren’t an indication that Barstow daydreamed as much during spelling lessons as he did during math class. Creative spelling was common in the colonies in the 18th century. You can read a complete transcript of the song, and more about this story, at the Gilder Lerhman Institute’s website. Thanks to Sandra Trenholm of the Gilder Lehrman Institute.